Bok Tower played a part in Nancy's regular childhood trips with her family from Miami to visit relatives in Georgia, but not so much since then; her previous trip was when she visited as a teacher with her school's camping club in 2009. 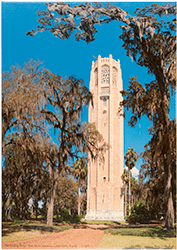 In 2016, we were exploring the area just after an art festival in Lake Wales and decided to visit Bok Tower Gardens. On this trip we brought our new Gigapan unit. 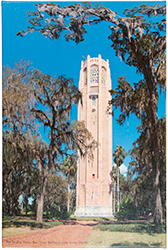 Opening in 1929, the 205-foot tower was built on Iron Mountain, part of the Lake Wales Ridge and the highest point on the Florida Peninsula (295 feet above sea level) by Dutch immigrant and editor of the women's magazine Ladies Home Journal, Edward W. Bok, after a winter trip with his wife in 1921. 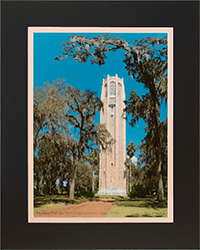 The tower holds a 60-bell carillon, and the gardens have tens of thousands of plants, many birds and some wildlife, trails, and a visitor center. Inspired by Bok Tower and trying to capitalize on Florida's early booming tourist industry, two other tall towers were later built along the Lake Wales Ridge; first the Florida Citrus Tower in Clermont, a 226-foot tower was built on ground about 200 feet above sea level in 1956, and then the Lake Placid Florida Tower, a 270-foot structure on land a hundred feet above sea level opened in 1961. Each of these towers was less successful than its predecessors. This image is 72,838 pixels high by 52,744 pixels and spans around 130° by 94° of view. For a better close-up view of the full-size image, go to our Gigapan.com page. Photographic details: Canon EOS 7D Mark II camera w/ EF 100-400mm f/4.5-5.6L IS USM lens set at 135mm mounted on Gigapan unit. 336 photographs were used in 21 rows and 16 columns. The capture took sixteen minutes. Flash was not used. Camera was on f/25 for 1/30 sec at ISO 100.